The Documented Life Project's prompt this week is leaves and the prompt for Journal 52 is stencil It. I made the stencils for the fern & birds from a dies a friend loaned me. I cut them from plastic packaging that I recycled. The background was painted with purple and hot pink paint. Then I stenciled the half circles using gesso and a Michael's stencil. After it was dry I put a light coating of blue paint over the gesso. Next I stenciled the ferns and branches with green paint. 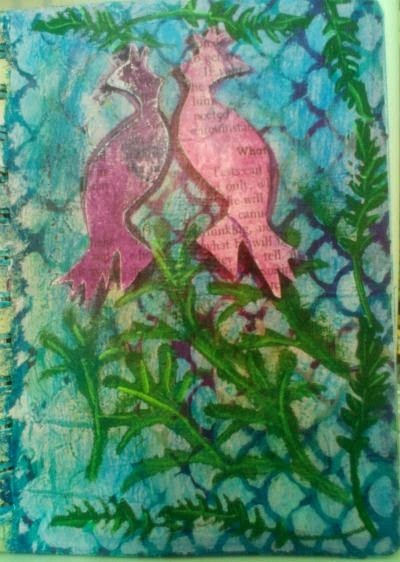 I stenciled the birds in purple paint on the journal page. Then I moved the stencil to the right a tiny bit and stenciled again so the birds would have a shadow. Then I stenciled them again on book text. I cut out the book text ones and glued them on top of the shadows. I love how distressed the page looks. I really like how parts of the purple peeks out through the blue.